Revisiting a much-changed Cambodia, Philip Sherwell explores the glories waiting to be discovered away from the tourist track. The temple complex of Angkor and the nearby town of Siem Reap were very different places the last time I visited. That was in 1996 on assignment for The Sunday Telegraph to cover the kidnapping of a Briton by the Khmer Rouge, the murderous Maoist movement that had inflicted the horrors of the Killing Fields on Cambodia. Sadly but predictably, Christopher Howes, who had been working with a British organisation clearing landmines, was murdered by his captors. Siem Reap in those days was a dusty backwater, its potholed streets best negotiated on the back of spluttering motorbike taxis that rarely got up enough speed to pose any danger of bodily harm. Angkor was being rediscovered by the first intrepid visitors after nearly two decades in Khmer Rouge hands. By early 1996, the main cluster of temples was safe, but outlying sites remained off-limits unless one wanted to risk being blown up by mines or suffering the sad fate of Mr Howes. In delightful solitude one early morning, I set off to explore the remarkable main temple of Angkor Wat, followed by the glorious bas-reliefs of Bayon and the barely touched remains of Ta Prohm, then the ultimate in Indiana Jones adventures. How things change. 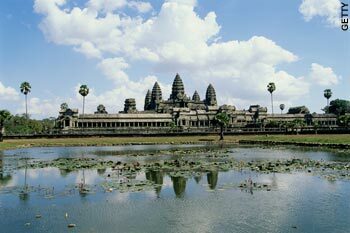 Siem Reap is now a boisterous hive of activity, while the marvels of Angkor are thoroughly on the tourist track. The temples are still one of the wonders of the world, no less stunning for the crowds, but I hankered after the glorious loneliness of my previous visit. So I headed 50 miles north, past paddy fields and villages of wooden huts on stilts little changed by the rapid development that has swept Siem Reap. Eleven years ago, this would have been a suicidal journey into Khmer Rouge territory, but my return offered new possibilities: outlying temples, cut off back then by minefields, were now accessible. My destination was Beng Melea, a 12th-century temple built to the same design as Angkor Wat. For visitors disappointed by the busloads of camera-toting tourists at Ta Prohm, these largely undiscovered jungle ruins are a treat. With the help of a young guide, I scrambled through the site to the chirupping chorus of cicadas in the same stunned reverie I felt when I first wandered around Angkor Wat. First he showed me a sign on a mound next to the overgrown moat enumerating the 21,000-plus mines cleared from this site alone. Inside the compound, thick, gnarled trunks and roots thrust through the masonry with such abandon that the stone and wood seemed indivisible; branches and vines stretched, embraced and bent around the ancient masonry like tentacles. Back in Siem Reap, I found another compelling reason to embrace rather than bemoan the changes of the past 11 years - the award-winning glories of the chic new Hôtel de la Paix. Its art deco façade - think South Beach Miami transported to South-East Asia - graced the cover of Architectural Digest magazine last year. The original hotel served as a rice storage depot during the era of genocidal communist purdah under Pol Pot. The elegant new structure is a mix of traditional Khmer, art deco and contemporary influences. The rooms have polished Makha-wood floors, woven rugs, platform beds and terrazzo tubs. Fountains and ponds fill the open spaces. But although La Paix is an enticing oasis, the last thing the hotel wants is for you to insulate yourself from your surroundings. It offers guests the chance to support community-based activities and good causes and the revival of Cambodian arts and culture. Options include a sewing training centre, rice sponsorship, educational support, hospitals and children's centres. As the recipients of the book, bikes and other items from the hotel scheme can vouch, progress is not all bad.